Today I found out there once was a baseball player traded for baseball bats. “Bat Man”, as he was nicknamed after the trade, was actually named John C. Odom. His life ended tragically just six months after the momentous trade. After being signed by the San Francisco Giants in 2003 out of Tallahassee Community College, Odom was assigned to play in “A” ball. He pitched for a total of four seasons for the Giants, splitting time between their Salem Keizer Volcanoes and Augusta Greenjackets A-ball affiliates. During that time, he underwent Tommy John surgery (2005) and dislocated his shoulder (2007), which held his progression back somewhat. The Giants decided to let him go in 2008, despite Odom having put up decent numbers, though never having progressed past “A” ball. 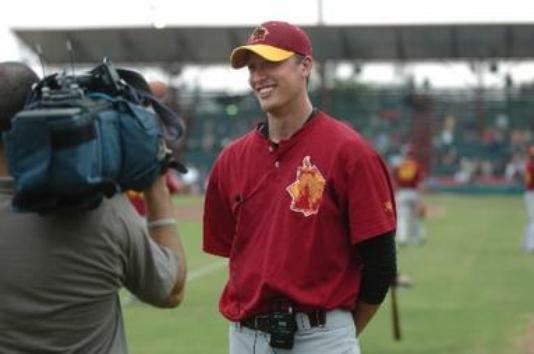 While with the Giants affiliates, he struck out 7.35 per nine innings over 140.1 total innings with a 3.98 ERA. And while I couldn’t find his career walk rate, at least in 2006 he average only 1.95 walks per nine innings, so seems to have had pretty good control, particularly for his age. After being let go by the Giants, he signed on with the Calgary Vipers of the Golden Baseball League. However, when he tried to get into Canada, he was denied entry due to having an aggravated assault conviction on his record from when he was a teenager. The Vipers then sought to find someone to trade Odom for and ultimately settled on a young position player from the United League Laredo Broncos, but the player in question refused to move to Canada. So once this deal fell through, Jose Melendez, the Broncos’ general manager, decided to offer the Vipers $1000 instead. 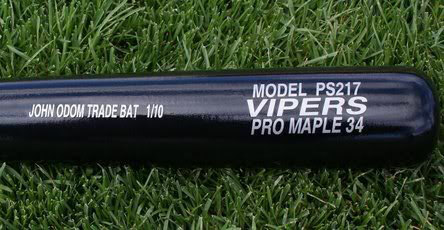 However, the Vipers had a policy of not making trades for cash, as they felt it made the team seem financially unstable, so they turned it down and requested maple baseball bats. Specifically, they requested 10 Prairie Sticks 34 inch Maple baseball bats (Model PS217), currently valued at $87 per bat. Although, with a 7.5% discount when ordering 6-11 bats, the total value is $804.75. Melendez accepted and sent over the 10 bats. He made just one more start after that, before telling Shwam, “Skip, I’m going home. I just can’t take it. I’ve got some things to take care of. I’ve got to get my life straightened out.” He subsequently got offers to play for other teams and even Shwam called him up at the beginning of January 2009 to see if he wanted to pitch that season, but unfortunately at that point Odom was already dead. He died on November 5, 2008, of a drug overdose with a cocktail of methamphetamine, heroin, benzylpiperazine, and alcohol found in his blood. As for the bats, they never ended up getting used and have since been sold to Ripley’s Believe It or Not who agreed to donate $10,000 to a charity of the Vipers’ choice if they could have them. This wasn’t the only time the Calgary Vipers’ had tried to trade a player for equipment. According to Peter Young, their one time team President and now Director of Baseball Operations, they had previously attempted to trade a player for 1,500 blue seats for their stadium, which they were in the process of renovating. There was also an actual Major League pitcher named John Odom, nicknamed “Blue Moon Odom”. Blue Moon played in the Majors from 1964 to 1976. While not a particularly good pitcher by any stretch, he was a member of the 1972-1974 Oakland Athletics that won three World Series in a row during that span. Blue Moon got his nickname all the way back in grade school from a friend who thought Odom’s round face looked like a moon. Before pitching in the majors, Blue Moon lead his high school to two state championships with a 42-2 record, including a whopping eight no-hitters. Blue Moon Odom also had a substance abuse problem, similar to “Bat Man” Odom. In 1985, Blue Moon was arrested when he was caught selling cocaine. A short time later he was arrested after a stand-off with police where he threatened to shoot his wife if the police didn’t stay away. After six hours, he gave up and was taken into custody. He was sentenced to six weeks of alcohol rehabilitation, then another eight for selling the cocaine. The scouting report on Bat Man Odom was that he was a 6 ft. 2 in. right handed pitcher, featuring a 90 mph fastball, complemented by a good biting curve, and a decent change-up with good command. Certainly a repertoire which is often Major League worthy.